At this evening's meeting of the school council we discussed the issue of parents bringing dogs on to the school site. 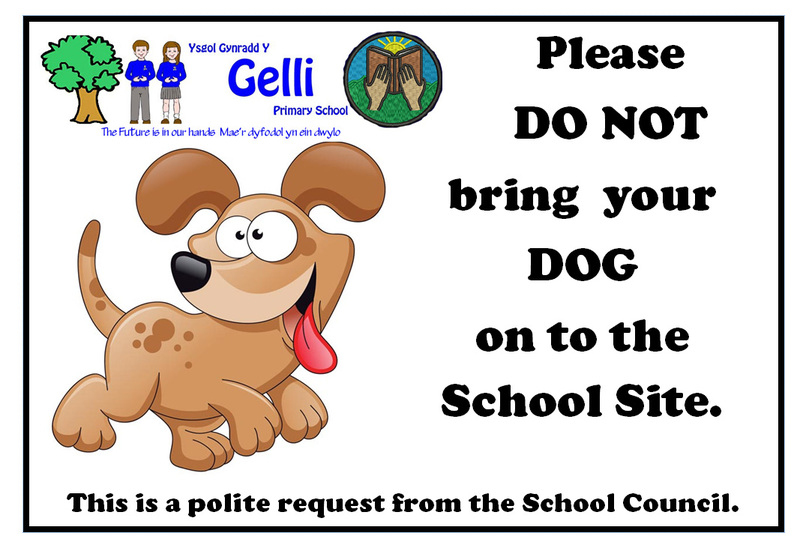 This is a health and safety issue and the pupils are politely requesting that parents do not bring their dogs on to the school site. The pupils highlighted that dogs could make some mess on the areas where they would be walking home and some dogs may attack pupils or other dogs and frighten the younger pupils. They designed this poster to alert parents. Your co-operation will be gratefully appreciated. Llongydarchiadau to Niall and Ebony for reaching their 10 dojo target this week and its only Thursday. I have received several complaints from local residents regarding inappropriate and illegal parking in and around the school. The main area that residents are aggrieved about is the lane behind Ystrad Road and the school. The picture to the left is an example of how one resident was unable to access his vehicle to go to work. Not only are these vehicles parked illegally, the parents, when approached by local residents about this are often offensive and abusive. Some in front of the children. The Highways Act 1835 Section 28 Parking on the Pavement Causing an Obstruction. And. considering the junction, and the volume of traffic and the regular occurrence of accidents, The Road Traffic Act 1984 Section 22 and 22A Parking In A Dangerous Position As To Increase The Likelihood Of Danger To Other Road Users. I am requesting that spot checks will be made by local police officers to prevent this from happening and subsequent fines and points on licences will be the consequence of those who violate the law. Over the years, our close neighbours are very supportive of the school and often act as "neighbourhood watch" especially in the summer months when local youths are prone to frequent the yard making any the police aware anti social behaviour and vandalism in the yard. Please respect their right to access the lane and their garages. Parking on zig zags and on the double yellow lines outside school is also increasing as is the number of cars accessing the car park. I would appreciate your co-operation with this matter. Gelli Primary School is being inspected by Estyn on 14th-17th March 2016. A questionnaire seeking parents' views can be completed by following this link to the ESTYN website – the deadline for completion is THURSDAY 25th FEBRUARY. The five digit code needed to access the site is available from school. You are also invited to meet the inspectors at the school at 15:30 on Monday 14th March in the school hall. 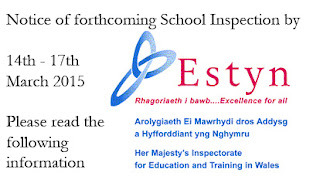 Further information about the inspection can be found in an Estyn leaflet which you will receive soon by pupil post and will be available on line if you have not already done so.